The headline aroused my suspicions right away: “Tim Hudak Seeks Andrea Horwath Support“. The story that followed it was comprised mostly of an open letter that the Progressive Conservative party leader, Tim Hudak, had written to New Democratic Party leader Andrea Horwath (and shared with everyone who would bother to read it). The letter started with a host of insults and attacks: Horwath and her party “don’t grasp” that the governing Liberal Party of Kathleen Wynne is not serving the public; are shockingly “not troubled” by Liberal corruption and moral bankruptcy; are “enabling” the Liberals; have priorities that are “in sync” with the Liberals; have chosen not to “put the needs of Ontario first”, etc.. It concluded with “So let’s sit down and talk about it, sooner rather than later.” In other words, it was a punch in the nose followed by a feigned invitation to kiss and work together. “Bush league”, I thought, “Hudak wants everyone to believe the falsehood that he wants to work with Horwath, and wants everyone to believe that Horwath refuses”. As predicted in my tweet, Hudak followed up his first open letter to Horwath with another one, six days later. It began: “Your lack of reply to my letter last Sunday asking you to help restore Ontario’s faith in its elected leaders, and to meet with me to bring an end to the Liberals’ established pattern of self interest has me troubled that you have already struck another backroom deal with the McGuinty-Wynne Liberals to continue to prop up their minority both now and in the spring”. Just in case his reader was too thick to understand his completely un-subtle first sentence, he added later in the letter: “These people want to know whether you are on their side with me, or whether you have lost your moral compass and will continue to support the Liberal government. I am very worried that as much as you talk about change, your definition of “change” simply means changing the terms for your alliance with the Liberal Party.” Got that? 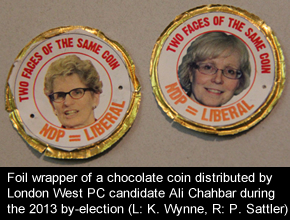 The narrative is that the Liberals and the NDP are essentially one party; an unholy alliance. The PCs, he wants everyone to believe, are the only party opposing the sorts of things that that unholy alliance is doing. The PCs are just trying to spin things that way, but it’s not true. They never assumed Horwath would join hands with them, they’re not “adjusting” their strategy, and their goal is not to make Horwath “pay a price” per se. Their only goal is to turn three electoral options into two. They are operating – as they have for over a decade – on what we Freedom Party types call the “Hammerhead Principle”. It has two parts, the second being the Hammerhead Strategy. When enough swing voters get aggravated by the party in power, they turn to the party that is most likely to replace them (based upon popularity): “the biggest hammer”. Every idea for change is a reason not to like the biggest hammer, so the party playing the Hammerhead strategy speaks of being “bold” and “principled” but desperately tries never to show a commitment to any ideas at all. (b) …the big hammer wouldn’t change any of the aggravating stuff that the government is doing. Hence the Hammerhead Strategy failed for Lyn Mcleod, who came into the 1995 election with 52% in the polls, but who dropped when she repeatedly flip-flopped on whether she opposed hated NDP policies (flip-flops highlighted in PC election commercials). Hence it failed for Hudak, who likewise went into the 2011 election high in the polls, but dropped when he essentially ran on the Liberal platform: more money for health and education, while miraculously balancing the budget by 2017-18 nonetheless. Hudak’s doing it again. He’s learned nothing from 2011. In over 200 pages of relatively painfree, change-free PC “Pathways to Prosperity” green papers, there is no explaination of how a PC government would balance the budget. Instead, there’s just a single sentence, saying that the PCs will come forward, just prior to the next election, with a plan to balance the budget. He’s still trying to convince the public that he’s a force for “change” – a source of “bold” ideas – without committing to any substantive ideas at all: he is careful to say that the Pathways to Prosperity documents are not plans or election planks, but are just various ideas offered up for public discussion. Hudak’s PC team doesn’t want to be associated with Horwath’s NDP at all. He wants the public to see Horwath (whose personal popularity is high, according to polls) as falling into category (b) above: he wants the public to believe that he wants to put an end to the ‘bad stuff’ that the governing Liberals are doing, and wants the public to believe that that is why Horwath rejects his invitation to co-operate and oust the Liberals. Instead of comparing and contrasting policies – which would either show him to be essentially not different from the Libs/NDP (see problem b), above), or show him to have a “scary” plan (see problem a) above) – he is comparing and contrasting: willingness to work together. Working together – in his strategy – means being unified, one, indistinguishable, etc.. Think about it. The letter last week took the following form: “You’re a low down dirty scoundrel. I invite you to work with me.” The first sentence intentionally makes the latter invitation an impossibility. Then, as I last week said he would, Hudak comes forward now with feigned disbelief and disappointment that the person he insulted didn’t take up his offer to meet. He wants the PCs to be seen as a party that is different from, and better than, the Liberals, and he wants a PC government to be seen as the way to end the bad things that the Ontario government is doing. But it’s all spin. His PCs are demonstrably the same as, and no better than, the Liberals. A PC government would not end the bad things that the Ontario government is doing. 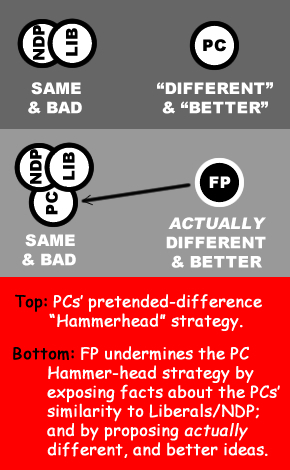 And, as soon as the voting public realizes that is the case, the PCs’ attempt to win the next election by using the old Liberal/PC Hammerhead Strategy will fail. No self-respecting anti-leftist who learns what we continue to teach the public about the history of Ontario politics/governance could ever see the PCs as being a right-wing alternative to the Liberals or NDP. And it works (also here and here, and here, and here, etc.). At the same time, we highlight the fact that the PCs are trying to get sucked into power without putting forward any ideas. We do that by putting out specific proposals in our election platforms, and comparing them to the status quo being offered by the PCs, Liberals, and NDP. While Hudak’s busy trying to ensure that Horwath and Wynne occupy the left goal post – without taking any unambiguous and firm stand on the issues – we’re working to ensure that his PCs join them there.